Halloween is over! That was awesome!! I have to say this years costumes seemed a whole lot more creative and amazing than ever. Friday people were slacking a bit with costumes, so I didn't know what to expect Saturday, but those worries soon abated as tons of people came in dressed up almost as soon as the doors opened. Guess they were saving up their energy for Saturday's festivities. Some of my favorites were Ryan Evans as Pinnochio, Carmel as Kiss in full make-up and gear. Also these two people that came dressed up as X-Men characters Nightcrawler and Mystique. Wow! Amazing! But really there were tons more, I just can't remember them all :) Luckily there's tons of pics out. Thank God for the camera! 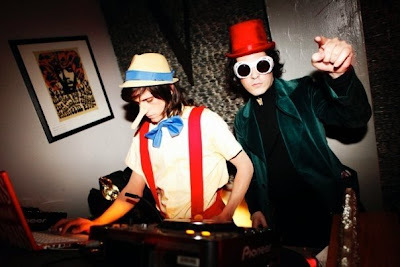 Here's a pic a neighbor of mine took of Ryan and I by the DJ booth at one point. Willy Wonka it was this year for me. Anyway's it's Monday so it's time for some New Music! 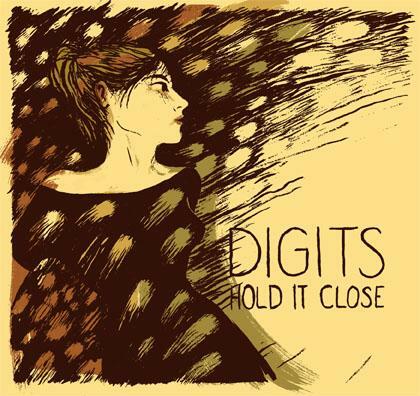 Last week Toronto based solo electronic artist Digits sent us a copy of his debut album 'Hold it Close' and I am loving it! He's like a heavenly mix of Erlend Oye vocals with Junior Boys type beats/electronics. Needless to say I love both those artists so it's no surprise I'd love this. The chorus of slow burner 'Sarah' sizzles! Here's that plus 'You're Going to Age' and 'Nonstop' also very, very good and more danceable! Enjoy! LOVE this and nice costume Ray Ray. thanks brother! hope all is well in the far east!